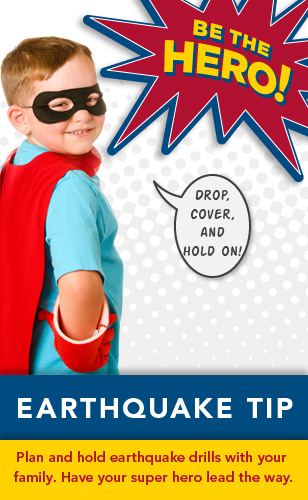 Earthquake Tip: Drop, Cover and Hold On! National Preparedness Month Tip of the Day: Planning and holding earthquake drills will help safeguard your family. Plan and hold earthquake drills with your family. Know where and how to shut off electricity, gas and water services. If indoors, stay there until the shaking stops. Make sure to drop down to the floor and take cover under a sturdy piece of furniture or an interior wall. Hold onto the furniture and keep your position. If outdoors, move into an open area away from trees, buildings, utility wires or signs. Stay in the open until the shaking stops.